Last week’s focus was the evidence in favor of a low-protein diet. In this context, high-carb diets came out on top. But there is also evidence that for the average denizen of the developed world who does not restrict protein, there are dangers in a diet based on staple carbohydrates, especially sugars and simple starches that pass quickly from the stomach to raise blood sugar. Beginning in the 1970s, health literature convinced Americans to avoid fatty foods, and the processed food industry was eager to oblige, advertising “low fat”, while adding more sugar to make foods tasty, and taking advantage of a new, efficient chemical process that made high-fructose corn syrup cheaper than sugar. But as we substituted carbs for fat, we became obese and diabetic. Metabolic syndrome and Type 2 diabetes were new terms added to the medical lexicon to describe what was ailing us. Gary Taubes was first to hypothesize a causal relationship: Our high-carb diet was leading to insulin resistance (which promotes weight gain) and weight gain (which promotes insulin resistance)—a vicious cycle that he first wrote about in the 1990s. Diets that are high in fat, low in carbs, are an effective way to lose weight, at least in the short term. Herman Taller, Robert Atkins, and Barry Sears taught this truth to three successive generations of Americans. In animal experiments, insulin and its cousin IGF-1 are the hormones that mediate the connection between more food and shorter life. 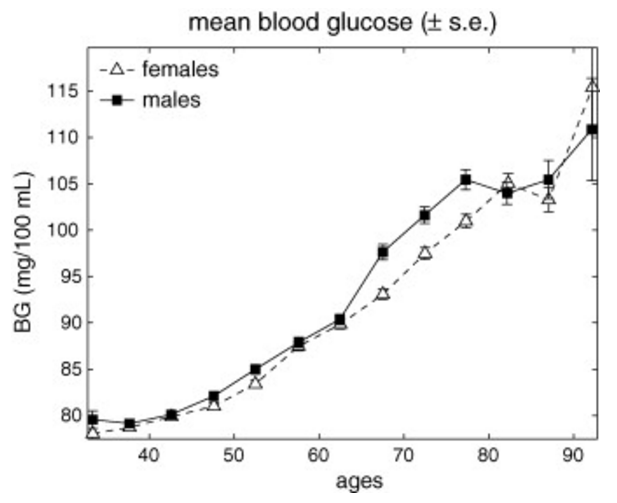 Blood sugar levels rise with age, and in people with genes for exceptional longevity, the rise happens more slowly. Blood sugar levels are a risk factor for mortality. So how much of a stretch is it, really, to say that the rise in blood sugar with age contributes to risk for the diseases of old age? The combination of biochemistry with population data associating carb intake with metabolic syndrome has convinced many people that a carbohydrate-based diet is a hazzard. But it’s a difficult case to prove, because humans don’t take well to living in cages, and because epidemiological studies of human aging require decades. In reading this week, I’ve discovered just how contentious is the whole subject of low-carb vs low-fat diets. Many such deeply divisive questions about health can be traced to corporate interests on one side, but this one may be academic, with ambiguous data, no long-term results, and different individual responses that are seen through different theoretical lenses. Although bottom-line questions about mortality and life expectancy may be difficult to address in human studies, we might hope for an answer to the question: Do people whose diets have a lower glycemic index have a lower risk of metabolic syndrome? The best study I’ve been able to find on this question  associates insulin resistance with dietary factors in 2,800 sons and daughters of the original Framingham heart study. After adjustment for potential confounding variables, intakes of total dietary fiber, cereal fiber, fruit fiber, and whole grains were inversely associated, whereas glycemic index and glycemic load were positively associated with [insulin resistance]. The prevalence of metabolic syndrome was significantly lower among those in the highest quintile of cereal fiber and whole-grain intakes relative to those in the lowest quintile category after adjustment for confounding lifestyle and dietary factors. Conversely, the prevalence of metabolic syndrome was significantly higher among individuals in the highest relative to the lowest quintile category of glycemic index. Fruits and whole grains were found to provide protection against insulin resistance, despite the fact that they are primary carb sources. Presumably, it is only sugar and simple carbs (white flour, rice, potatoes) that add to risk of insulin resistance. A South African doctor collected stories from patients who, by and large, were very satisfied with the results of switching to a low-carb, high-fat diet. Almost all lost weight. Some claimed that their diabetes was “cured”. In this study, people lost weight on a six-month program of either restricted fat or restricted carbs. But people who were already insulin-resistant did a little better on the low carb diet, while those who still retained insulin sensitivity lost more on the low fat diet. This study put obese subjects with metabolic syndrome on either a low-fat or low-carb diet for six months. Both groups lost weight and gained insulin sensitivity, on average. The low-carb group lost more weight and gained more insulin sensitivity. However, there was a lot of variation within the groups. Two NIH studies [one, two] by Kevin Hall just this year compared short-term effects on metabolism from carb and fat restriction. They put people in metabolic chambers to measure CO2 and H2O in their respiration, in order to calculate how much fat was being burned. Hall claims that the results disprove the insulin theory of weight loss. But to me the results seem puzzling and inconclusive. They claim to calculate that the short-term weight loss from carb restriction is loss of muscle, not fat. This is disturbing, if true. The metabolic calculations are based on isotope labeling and other sophisticated technologies. I trust the chemistry, but I tend to skepticism based on the fact that once in the body, labeled water gets mixed to an unknown extent with ubiquitous body water. Short-term studies with sophisticated metabolomic measurements might tell us a good deal about the body’s biochemistry, but still leave us wondering about long-term accommodations of hormonal balance, energy metabolism, and gut biota. Past positive results from low-carb diets, Hall says, are probably about “compliance” and not metabolism. “Compliance” is our ability to stick with a diet, and, IMHO, this should not be separated out as some kind of soft, psychological confounder. It may well be that the whole advantage of a high fat diet is that those people for whom it works—not everyone—feel less hunger and more sustained energy, and that may well be linked to insulin cycling. What can we conclude but that we’re each on our own, and we have to find the diet that works best for us as individuals? And that that our dietary needs may change with age, so repeating the self-experimentation at least once a decade is helpful. In experimenting on yourself, keeping weight off is probably as good a measure as any of how well your body is responding. The ranking by glycemic load is appropriate if you are trying to minimize total insulin burden. But if you are aiming for a low-protein, high-carb diet as described last week, then you are interested in glycemic index (because you want high-carb foods that don’t trigger insulin release). The catch (for protein restricters) is that most foods with low GI are protein sources. Which foods offer a combination of low protein and high carb without the insulin trigger? Grapefruit stands out, apples, pears and other fruits will be preferred carb sources. Some kinds of brown rice are more equal than others, while potatoes will be avoided because of too high a GI, while whole wheat and corn will be taken in moderation because they have too much protein. So lotsa fruit seems to be the answer…until we introduce one more wrinkle. Fruit contains fructose, and there is a school of thought that says fructose is much worse for you than glucose. There are two simple 6-carbon sugars, fructose and glucose, and table sugar=sucrose is a loose binding of one fructose with one glucose. Fructose and glucose are both sweet, and they’re often found together in fruits. Apples and pears have a lot more fructose than glucose, while bananas, peaches and sweet potatoes have a little more glucose than fructose. Honey has more fructose than table sugar. Starch is a polymer of glucose. It is quickly broken down (beginning in the mouth) into glucose molecules, so starchy foods have a high glycemic index. But starch is all glucose, no fructose. Glucose and fructose may be chemical cousins, but the body treats them quite differently in the short term. Glucose is fuel, usable right away. When you eat enough for your activity level, glucose is absorbed right into the blood, and it is consumed promptly. When you eat more glucose than you can burn, insulin is secreted, signaling the liver to remove some glucose and turn it to glycogen. The liver stores about a day’s supply of glycogen to be drawn on as necessary, and glucose in excess of that is turned to triglycerides, a form convenient for storing energy in fat cells. Fructose is also absorbed promptly from the stomach into the bloodstream, but it is removed immediately by the liver, turned directly to triglycerides. No insulin is involved. The short-term metabolism of fructose and glucose is well characterized, but you and I are interested in the long-term consequences of eating fruits high in fructose compared to starches which are quickly metabolized to glucose. This turns out to be a controversial topic. In recent years, Robert Lustig and Richard Johnson have argued that foods with more fructose than glucose lead quickly to insulin resistance. They blame soaring rates of obesity and metabolic syndrome=type 2 diabetes on the invention of a process for producing sugar from corn starch that is cheaper than cane sugar. The “high-fructose corn syrup” that results happens to be 55% fructose. I’m not so impressed with the “seven times faster”, because fructose doesn’t remain long in the bloodstream, and I’m not so concerned about free radicals because (as I’ve written) they are as likely to increase our life expectancy as to decrease it. Lustig also writes that because fructose tastes so good and bypasses insulin and blood sugar, it undermines the satiety response and leads to compulsive eating. But the most complelling claim here is about the loss of insulin sensitivity, which I regard as a hallmark of aging. Is fructose really worse for insulin resistance than glucose? Lustig says YES, and his theory is articulated here. Lustig makes his case by reasoning about biochemistry in the liver. But what about real evidence in real people? In short-term studies, substitution of fructose for glucose in the diet shows no sign of increasing insulin resistance; on the other hand, there is a well-known correlation between consumption of high-fructose corn syrup with metabolic disease. What Lustig comes to beneath the headlines is, “the dose makes the poison”; and I think this is a healthy attitude for all of us. Drinking sugared beverages and eating (more than occasionally) foods sweetened with high-fructose corn syrup damages insulin sensitivity. At the other end, eating a few pieces of fruit during the day can be part of many diet plans that work well for health and longevity. Those are the easy cases. In between we have the more difficult case of the semi-fructarian. That would be me. I get most of my carbs from fruit, and I avoid starch (rice, potatoes, bread, pasta). I maintain weight with exercise and portion control, I eat leafy greens every day and I get a ton of fiber, and though my protein intake is high compared to last week’s ideal (~60g/day), it’s all vegetable protein. Would I be better off if I backed off from my fruit consumption and substituted whole wheat bread and other complex carbohydrates? It’s an experiment that I might try next winter—but not in September when every kind of delicious fruit is fresh and abundant. In any case, there is a consensus view that moderate fructose is part of a healthy diet, and that excessive fructose exacerbates the ill effects of a sugary diet [ref, ref, ref, ref, ref, ref, ref]. After reading all these articles (well…reading all the abstracts and some of the content underneath), I’m not convinced one way or the other about fruits (glucose+fructose) vs grains (glucose only, from starch). Metabolic syndrome, including the “normal” version that comes with aging, is characterized by failure to respond to insulin, leading to both higher insulin levels and higher blood sugar. Is it the higher insulin level or the higher blood sugar that is responsible for the damage? YES. Insulin signaling speeds up the rate of aging. Sugar in the blood reacts with proteins to create cross links (glycation) that prevents the protein from folding properly. (Fructose is more prone to this reaction than glucose, but fructose does not stay in the blood so long.) Type I diabetics have no insulin, and if their insulin injections are not carefully regulated, they are at risk for blindness and nerve damage in the extremities, both from high blood sugar. So, with metabolic syndrome, both the insulin levels and high blood sugar pose risks. The proper medical terminology for this situation is “double whammy”. So both high insulin and high blood sugar are bad for us. With the separation of fructose from glucose, we have the possibility of coupling lower insulin levels with higher blood sugar. Is the tradeoff worthwhile? Is fructose the optimal low glycemic index sweetener? that different metabolisms respond differently to low-carb and low-fat diets. It leaves me counseling personal experimentation, which is what I always say anyway. Before each time that you eat, do 1 to 2 minutes of exercise, intense enough to leave you panting and drink a pint of water. The result is to suppress the sugar and insulin spikes that follow a meal, and to burn more of the food energy, store less as fat. I’ve been following the Ray Peat’s ideas on sugar. For one year at 65 yr., I have in the morning, all organic, 16oz coffee mixed with 16oz milk(raw if available) , 2 tbs butter, 2tbs coconut oil, 2 raw eggs, 6 tbs raw sugar, 1tbs molasses. During the day I vary what I eat between dried figs, dates, nuts, sugar added fruit smoothies, and maybe a chicken breast. Must be taking in up to 150 grams of sugar or more a day yet my morning glucose test around 90. I eat no grains or vegetable oil what so ever. I feel excellent, maintaining normal wt of 174lb for 6′. This is just another one of my dietary experiments that have ranged from SAD to raw vegan to just living on 100% raw milk for 4 months. I’m totally blown away how this style of eating is treating me so well. No salads and rarely fresh fruit. I’m not advocating this just reporting what I’m doing. Go figure. I fully agree that personal experimentation is the name of the game. However, to consider dropping my fruits and going into grains is something I wouldn’t touch with a barge pole. I stopped my experiment as a fruitarian when a blood test revealed that my B12 level was way too low. The fructose component of sugar or corn syrup has proved to be devastating, but dropping fruits is something I would not consider. I have one-kilogram brunch with five fruits and nuts that I won’t stop any time soon. So eat your carbohydrate with fiber… That includes sugar, that’s why fruits are okay, because number one, it limits how much fructose you are going to take in, and number two, it gives you an essential nutrient which you needed in the first place and you get some micronutrients along with it so that you actually can – your liver works healthier. So here is what fiber does. Number one, it reduces the rate of intestinal carbohydrate absorption. Now sometimes that’s bad. I will tell you when that’s bad. That’s bad when you’re at a formal function. Because what happens if you reduce the rate of carbohydrate absorption in your gut, the bacteria get to it. As far as I’m concerned in life you’ve got two choices – it’s either fat or fart. It increases the speed of transit of the intestinal contents to the ilium and that raises this hormone over here called PYY which goes to your brain and tells you the meal is over; that’s your satiety signal. So when you add fiber to your diet, you actually get your satiety signal sooner because the food moves through faster. And then finally it also inhibits the absorption of some free fatty acids all the way to the colon and then those get chopped up into little itty bitty fragments called short chain fatty acids and those actually suppress insulin as opposed to long chain fatty acids which stimulate insulin. So there are all whole bunch of reasons why fiber is good. Your program sounded interesting until I saw the “IU of HGH” part. How do you know your results are just the HGH effects? If HGH was so powerful to control glucose you would of heard of it. I take a very low dose of 1 IU a day. Also I have been taking it before I changed to this high sugar consumption and it never seemed to do anything to my glucose level. Fructose is absorbed in the enterocyte (intesinal mucosa) brush border microvilli by facilitated difussion. Once inside the enterocyte the fructose is biochemically COVERTED THERE! into Glucose. And it is in Glucose form how it passes the other membrane, the basolateral one, towards the blood capilaries of the mucosa. This is basic digestive Physiology. 1-fructose eaten can not lead to a DIRECT increase in blood Fructose in the portal vein (which directs blood with the absorbed materials to the liver from the intestine). 2-It is not the liver what mainly converts fructose to glucose. It is alerady the enterocytes what do it (the intestinal mucosal cell). Perhaps this helps to explain (in part) why fruits (rich in fructose) are GOOD indeed for our health. There is few discussion about that, and it is not a surprise at list for a biologist like myself: our closests living relatives are chimpanzees, gorillas and orangutans. The common ancestor of us” THE FOUR” (“higher” primates) were alive a few millions of years ago. A rather short period of time on Evolutionary terms…. Though this is different from what I have read about metabolism of fructose, I am happy to cede to Gustavo’s knowledge of biochemistry, which is far beyond my own. And I’m happy to know that all the fruit I’ve been eating is not a hazard. Gustavo – perhaps you can refer us to a source for basic chemistry of the metabolism of fructose.